Ornithologists have uncovered one of the world's most impressive migrations -- an epic journey from the UK to South America, carried out by an unassuming little bird. Each summer, a group of red-necked phalaropes breed and nest in the Shetland hills of Scotland, then fly south for their winter migration, but up until recently, no one was really sure where they ended up. It was believed that the small birds, growing just 7 inches long, wintered in the warm waters of the Arabian Sea. 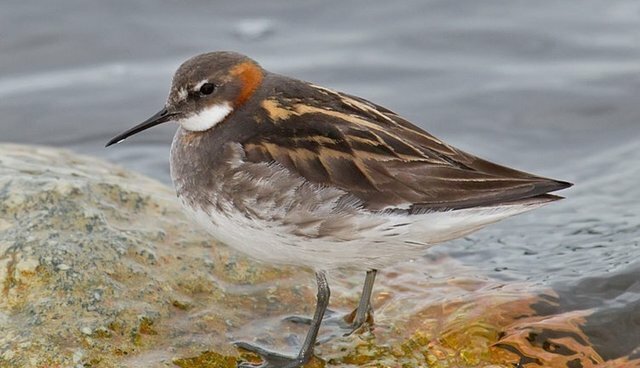 Researchers from the Royal Society for the Protection of Birds attached a geolocation device to the several red-necked phalaropes to track their route. When they collected the data the following year, however, they were stunned to discover the birds' actual long-distance travels. Instead of flying east, red-necked phalaropes headed west across the Atlantic, then traversed south over North America to the tropics of Peru -- a 16,000 mile trip, the longest migration recorded in any European bird. "To think this bird, which is smaller than a starling, can undertake such an arduous journey and return safely to Shetland is truly extraordinary," says Malcie Smith of the RSPB. "This tiny tracker has provided a valuable piece of the puzzle when building a picture of where phalaropes go when they leave our shores. We hadn't realized that some Scottish birds were traveling thousands of miles to join other wintering populations in the Pacific Ocean."